The pursuit of sustainability has generated lifestyle changes for individuals across the globe; innovations within the arts and sciences, business, design, engineering, and agriculture; historic policies and laws at municipal and state levels; and crucial international protocols and agreements. Yet the meaning of sustainability remains unsettled, and the term frequently serves as green veneer for business as usual rather than a driver of fundamental change. The second edition of this popular and lively book explores the concept and practice of sustainability through a broad range of current issues and debates. Fully revised and updated, the book integrates expanded global breadth with increased attention to the importance of local relationships and responsibilities, while illustrating that sustainability demands creativity as well as conservation. New Inquiry and Exploration sections with links to web-based resources are also included to help students probe and deepen central debates and topics. Sustainability presents a hopeful account of crucial opportunities while directly confronting the hurdles, disputes and challenges that lie ahead. It will be a valuable resource for students and general readers keen to grapple with one of the most pressing issues of our times. "Whether and how humankind survives the bottleneck ahead is the issue of our time. 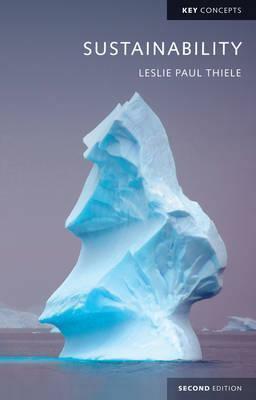 Les Thiele is a thoughtful and insightful guide to the perplexing and complex issues ahead. This is the best short book on sustainability in print." "There are lots of books about sustainability these days, but this one tells the story in a way that is both compelling and inspiring. It's one of the best introductions to the topic I have seen and at the same time has the perceptive depth to engage experienced practitioners." Leslie Paul Thiele teaches political theory and serves as Director of Sustainability Studies at the University of Florida. His interdisciplinary research focuses on sustainability issues and the intersection of political philosophy and the natural sciences. His central concerns are the responsibilities of citizenship and the opportunities for leadership in a world of rapid technological, social, and ecological change.